Turkish coin minting history goes back almost 2 thousand years ago; with such rich history Turkish gold coins market boasts a large selection of denominations and designs. 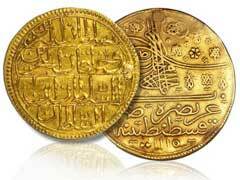 Perhaps the most common denominations you can see among Turkish eBay gold coins sold online are piastres kurush coins. In their uniqueness and rarity some of them can even compete with some of the rarest China gold coins with their similarly lengthy history. Turkish gold coins are currently undervalued and most of them sold at a hair higher than their actual gold content value. Most Western numismatists find elaborate Arabic inscriptions of older versions confusing and impossible to read, which makes it difficult to assess whether a certain coin is going to be a sound collector purchase or have a good investment value. In addition to Arabic writings, it was common in old Muslim world to use Hejira calendar that is different from the Julian calendar used in other parts of the world. However, do not let this prevent you from appreciating the beauty and value of beautiful historical coins that have such long history. There are plenty of online resources that will help you convert old Arabic writing and help to assess their value. Starting in 1930 Turkey began minting Turkish gold coins using Latin letters and numbers making it easier for numismatists to recognize the year of the making and other essential parameters of coins. However, some numismatic professionals believe that it is the older gold coins that are more sought after due to their incredible numismatic value and historical significance. Once you decide to acquire a Turkish gold coin, you will be able to pick up a variety of selections at major Internet auctions like eBay or antique stores at a relatively inexpensive price. Due to the fact that such coins are currently undervalued, you have a chance to land incredible Turkish coins that have a potential to grow in price in the future. Despite the historical significance and rarity of Turkish gold coins, it’s clear that investors seeking to maximize their investment potential would be better off choosing modern bullion coins minted in the US, Canada, South Africa, China and Australia. These coins exercise much better liquidity and allow you to buy the physical bullion a little bit over the spot price of the precious metals since they carry much lower deal premiums. If you are working on expanding your international coin collection to include a wide array of pieces from various countries, read other articles on our website to learn more about French gold coins and German gold coins.